WALKSTRONG ~ www.walkstrong.ca: " Union of the Snake ... "
" Union of the Snake ... "
Today millions ring in the Lunar New Year with parades, paper lanterns and firecrackers and celebrate the Year of the Snake. The Chinese zodiac calendar is known as Sheng Xiao and is divided into 12 cycles. Each cycle is represented by one animal ... the rat, the ox, the tiger, the rabbit, the dragon, the snake, the horse, the sheep, the monkey, the rooster, the dog and the pig. So we say goodbye to the Dragon (2012), the fifth cycle and symbol of good fortune and positive vibes ... and hello snake! and revered for it’s undeniable charm”. What does the year of the snake mean? Well, it seems in Chinese mythology, snakes were associated with monsters, or with incarnations of monsters. So astrologers believe there is a way to deal with the “destructive powers of a snake” by wearing a monkey pendant. It seems the monkey is the only animal that can handle the snake. 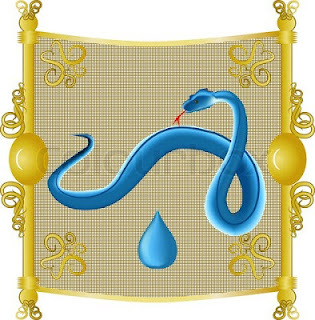 As well, the specific element that governs The Year of the Snake is water, adding the 2013 snake is more moderate, humble and patient. As for people born in this year, they are believed to be intuitive, introspective and refined ... but can be seen as manipulative, scheming, excessively proud and vain (ouch!). Pundits say these years are always intense and following the yin and yang concept, for the universe to balance, the dragon yang’s positive force will match the snakes yin negative force. Yet they are not to be considered good or bad in the moral framework, they simply are. You see as the dragon exits and the snake begins to uncoil, things may seem out of balance, feelings will become more acute and sense will be heightened. The snake is considered wise and unforgiving and history has shown that the snake year is never tranquil. Seeing that this year offers the opportunity to see more, notice more and exercise perceptive abilities to support our decision-making. Think of the water snake shedding its skin, releasing the old and preparing us to rattle past realities. Spiritually speaking, the Snake is transcendental in its capacity for healing. Seeking peace through recalibration of the karmic balance, it understands the mistrust born of chaos in which the world finds itself. And the water element that rules this cycle counsels balance in compromise as a path to peace.
" Into The Void ... "
" Definition of Destiny ... "
" Too Intense ... "